Cincinnati Hills SAY Soccer was formed 15 years ago as your local SAY Area recreational soccer organization. Our goal is to provide the best soccer experience for all participants - players, referees, coaches and spectators. Today, we have over 1,800 players, 150 coaches and 120 referees participating in our program. Our long-term objective is not about growing the size of the organization. Rather, we are totally focused about continually improving the quality of our soccer program! Each District will continue to run their own soccer programs but will be operating within the guidelines of Cincinnati Hills SAY and SAY USA. Each District is now able to draw on the resources, infrastructure and experience of Cincinnati Hills SAY and SAY USA to enhance the overall scope and quality of their programs. 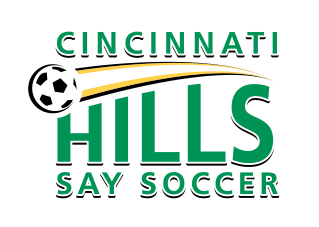 Cincinnati Hills SAY is managed by a Board of Directors who meet four times a year as a group and are all focused on providing an exceptional soccer experience for everyone involved in our program. As a valued participant in our program, we hope you have a great recreational soccer experience.